This page is going to introduce an easy way to recover deleted media files from Android device – HTC One M9+. How does files get lost from cellphone? Just like other Android phones, HTC phone can’t escape data loss issue. But, it’s no longer difficult to get back deleted files from Android phones. Though cellphone does not have Recycle Bin for users restore deleted data just like operations on PC, it’s still able to get back deleted, lost or formatted data. To guarantee best recovery result, you should make sure there are not new files added to the device you want to recover data. For instance, if you want to recover deleted media files, say photos, you should at least make sure there are not any new photos being taken or appearing in photo album. That’s because deleted files will be damaged if you keep taking photos or recording videos with the phone. Newly stored files will occupy the place where lost files were stored, which overwrites deleted data. If that happens, you’ll lose the chance to recover lost data completely. To recover deleted media files you need the help of HTC data recovery software to get backup lost data. Eassos Android Data Recovery is the right tool for you. It works perfectly in restoring lost files after deletion, formatting, factory restore, etc. You can try this software which has a trial version. If it indeed finds out what you need, buy it and recover data. It is able to detect Android devices automatically and deeply scan selected device. It makes images for SD card or internal memory space and then recovers data from image files, which is safe and won’t affect lost data. 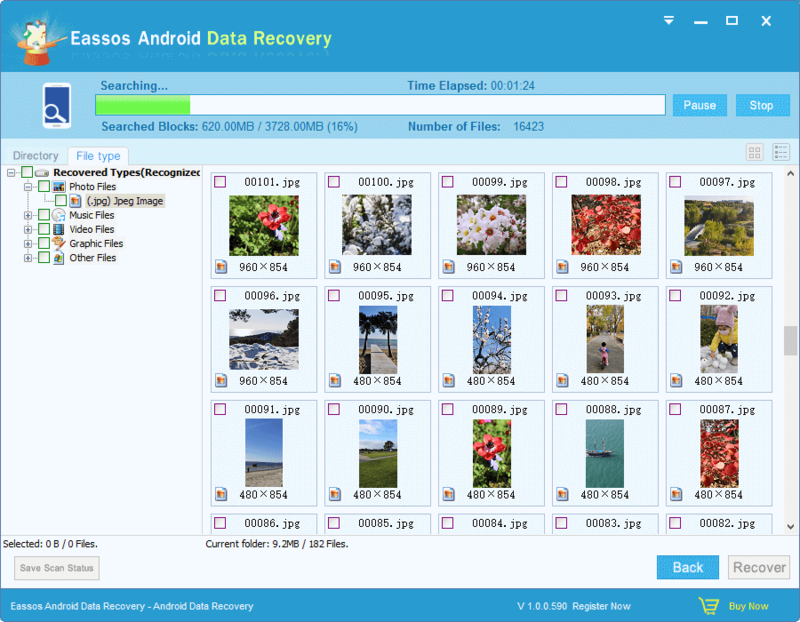 Eassos recovery software supports recovery of photos, videos, documents, music, SMS messages, contacts, etc. It has high compatibility, support various Android brands and systems, such as THC, LG, Motorola, Nexus, Samsung, etc. It supports 2000+Android devices and all popular Android OS. It recovers data with a recovery wizard, guiding users through the entire process. Recovered data will be saved on computer first to avoid file overwrite to phone. Recoverable files can be previewed before actual recovery, so that users can check file quality before purchase. How to recover deleted media files from HTC One M9+? 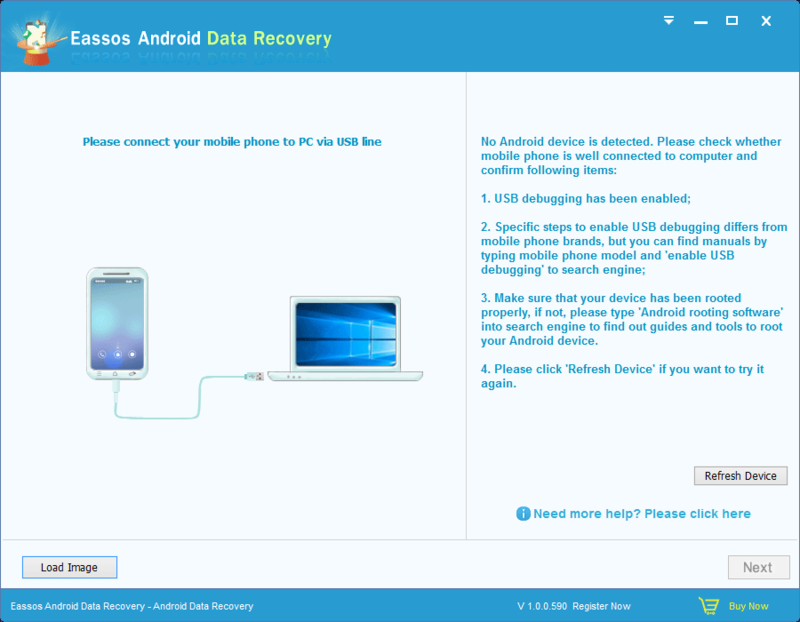 Step 1: Start Eassos Android Data Recovery Software after it is downloaded and installed to your computer. Use the USB cable to connect your HTC device to your computer. Note: You should root your cellphone before starting recovering data, otherwise it can’t be deleted and scanned by recovery software. Step 2: When your phone is recognized by the software, select storage location to scan data. Step 3: When scanning complete, it displays data on the interface under different categories. File preview is available before recovery. Step 4: Select files you need and click “Recover” button to get them recovered. This entry was posted in Android data recovery and tagged Eassos Android Data Recovery, HTC data recovery software by EASSOS. Bookmark the permalink.